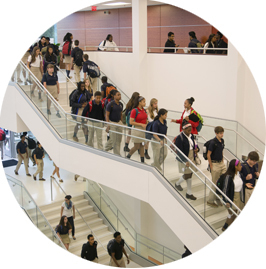 At Woodward, students can explore virtually any interest because the Academy offers more clubs and activities, arts offerings, winning athletic teams, and service learning opportunities than one could ever exhaust. We want our students to grow into global citizens who respect and are responsible for themselves, others, and their community. Leadership opportunities exist at every level—beginning with our youngest students as Character Builders in third grade to the Upper School students who serve as Peer Leaders.